At just 3 years old, Horizon festival is quickly building up a reputation for becoming a major contender on the snow festival scene. Bansko is championed as Bulgaria’s best ski resort and features the longest ski runs in the country. Add to this a newly redeveloped ski area plus the stunning beauty of Pirin National Park and it’s easy to see why Bansko is becoming a firm favourite amongst snow fans. Boasting the longest ski season in Bulgaria from December to May and known to be Bulgaria’s most snow-sure resort, you can rest assured that limitless quality skiing and snowboarding is on the cards before the party has even started. Bansko is full of rich cultural history and unique architecture, containing charming cobbled streets and quaint stone buildings in the historic old town. 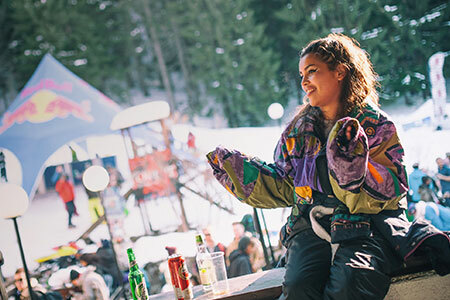 The new town offers a whole host of affordable bars and restaurants where you can choose from delicious traditional Bulgarian cuisine or burger heavy winter warmers to fuel your fun on the slopes. Quality comes in an attractive cost effective bundle in Bansko and you’ll be pleasantly surprised at how far your loose change can take you. With over 80 DJs and a whole host of white hot parties, this electronic extravaganza is moving mountains in Bulgaria’s most inviting ski resort. With a wealth of unique events and locations the festival brings anticipation the whole week through making sure the thrill never ends from the peaks to the parties. Secret pumping party locations keep energy levels high all week and you could find yourself raving in an abandoned factory or feeling the festival vibes throughout the forest. Get your kicks from Bulgaria’s best selection of red, blue and black runs before you invade the night alongside some of the hottest house, techno, bass, garage and dance acts working the festival circuit. Bonus points include beer from just £2.00 per pint and a local menu of mouth-watering value food. Horizon is predicted to be one of the best snow parties of the year. Find a cheap flight to Bulgaria from most main UK airports and fly to Sofia Airport (160 km from resort) or Plovdiv Airport (180 km). Pick up a festival transfer, book a private transfer, rent a car or take the bus (from the Sofia central bus station if flying into Sofia). Transfers by train provide a beautiful and scenic journey but can take much longer. Train from Sofia takes around 7 hours and from Plovdiv around 5.5.